I have decided to start my first blog! My New Year resolution - well, there is a few, but among them is to try eating something new. 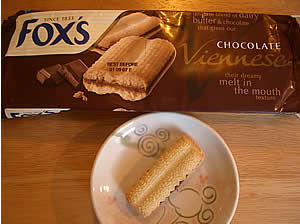 So I bought a nice looking Fox's Chocolate Viennese. The words "...melt in the mouth texture" caught my eye. Upon opening, I was pretty amazed at the difference of the biscuit to the image on the front! What mis-representation! I don't know how they took that picture! What angle did they take the photo from? Anyway, apart from that, the texture indeed was "melt in the mouth" and I enjoyed it very much. Bought another one on my next outing! Lovely!